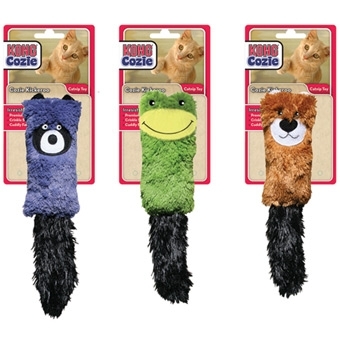 The Cat Cozie Kickeroo is made of ultra-soft plush fabric that cats love to tackle and cuddle. Each toy is packed with North American catnip and has a crinkle or rattle sound to help attract cats and initiate play. Kickeroo is filled with catnip. This large snuggly toy is great for active and quiet play. Unique shapes and textures and includes a crinkle sound.